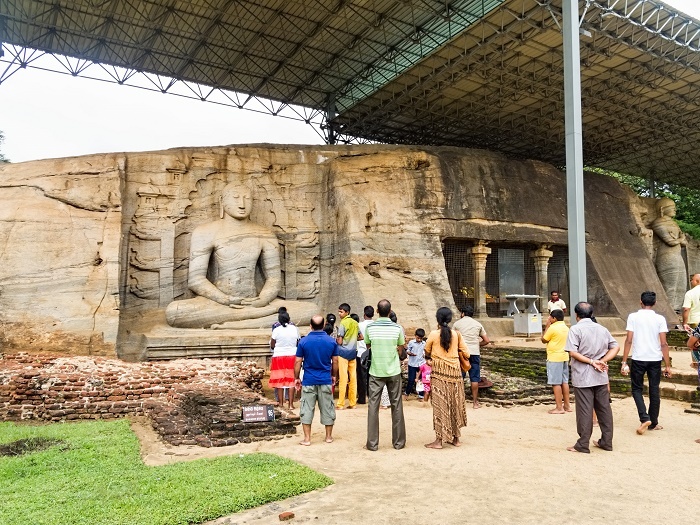 The Gal Vihara, also known as Gal Viharaya and sometimes by its original name as the Uttararama, is a rock temple of the Buddha with Buddha statues within, which is part of the ancient city of Polonnaruwa, located in the North Central Province of the Democratic Socialist Republic of Sri Lanka. 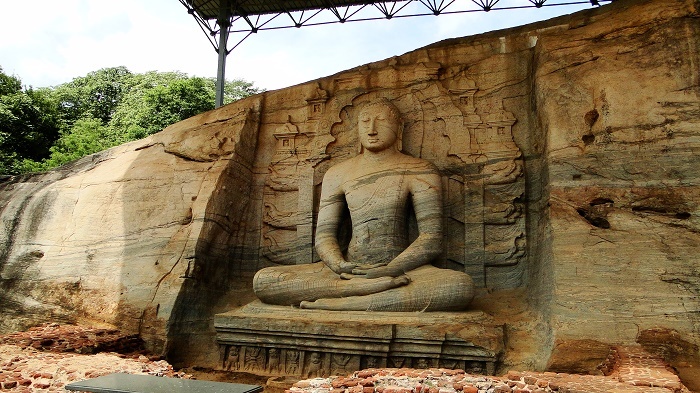 Being the most perfect specimen of Buddha statue hewn out of solid stone, there are four rock relief statues of the Buddha consisting of a large seated figure, another smaller seated figure inside an artificial cavern, a standing figure and a reclining figure. 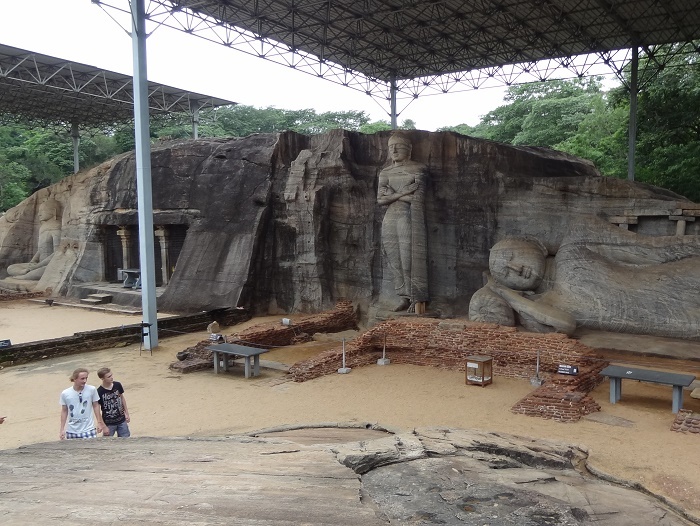 Dating back from 12 century, the statues have been crafted during the reign of King Parakramabahu I, meaning that they are very well preserved even though such long time has passed since their creation. 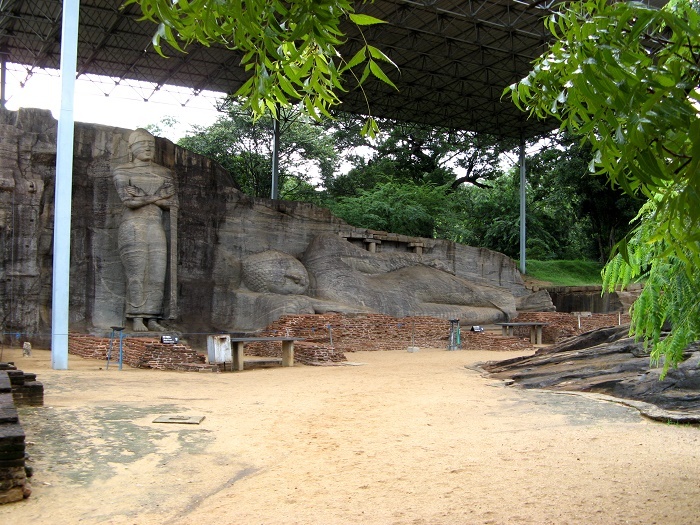 The first of the statues is the impressive seated Buddha in meditation, where the statue is seated on a carved throne, while in the background there are carvings of flowers and lions. 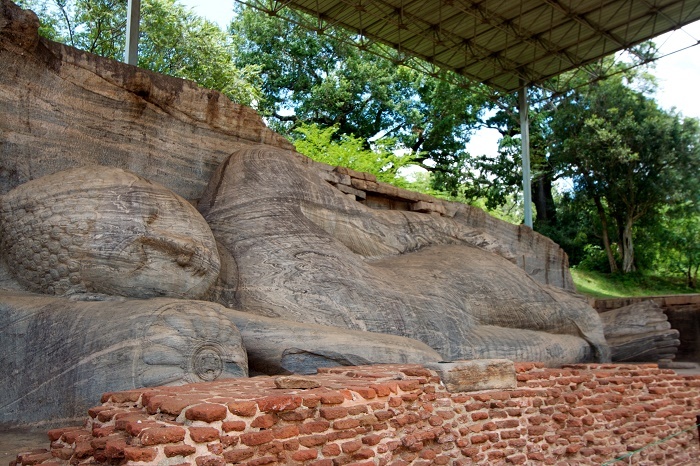 With almost 5 meters (15 feet) height, it is definitely an unusual feature in ancient Sinhalese sculpture which is considered to be the result of Mahayana influence. 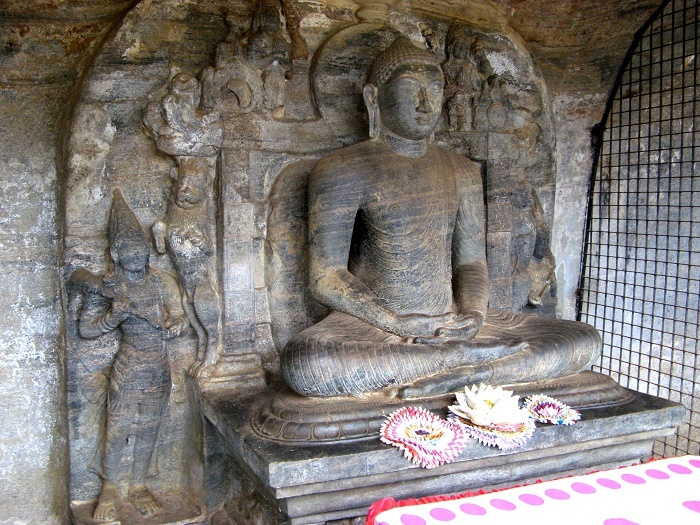 The small statue which is about a bit more than 1 meter (4 feet) high is somewhat similar to the larger one, however, this one is located within an artificial cave that is named Vidyhadhara Guha. 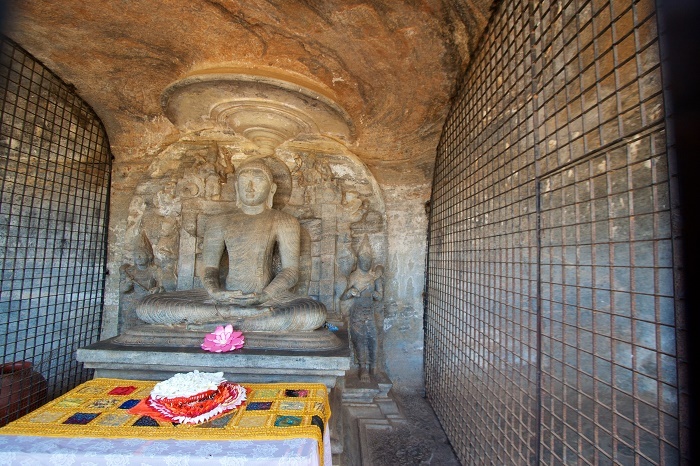 The cave was carved within the rock, leaving four square shafted stone columns at the sides, and the base of the statue is too in the shape of a lotus decorated with flowers and lions. 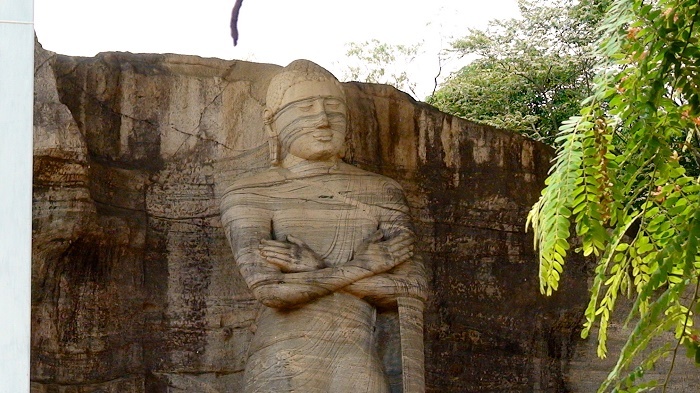 Behind the statue are carved a throne and a parasol that are much more elaborate compared to its larger neighbor. 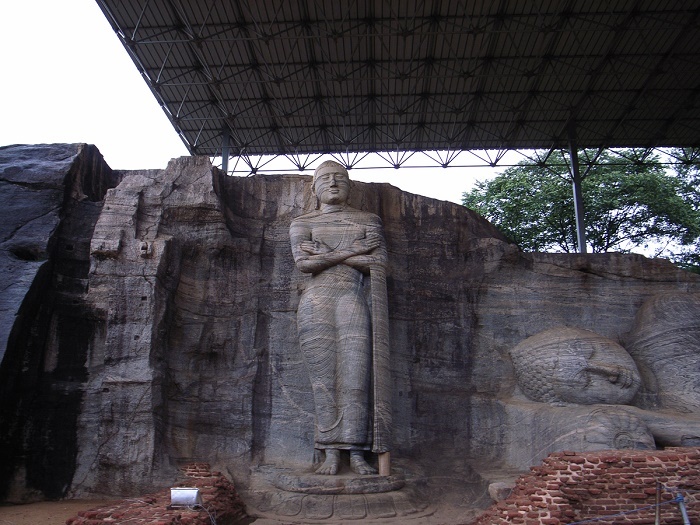 The following statue is the standing image that has somewhat battled the historians and archaeologists, since there is a general belief that it is not a statue of the Buddha. 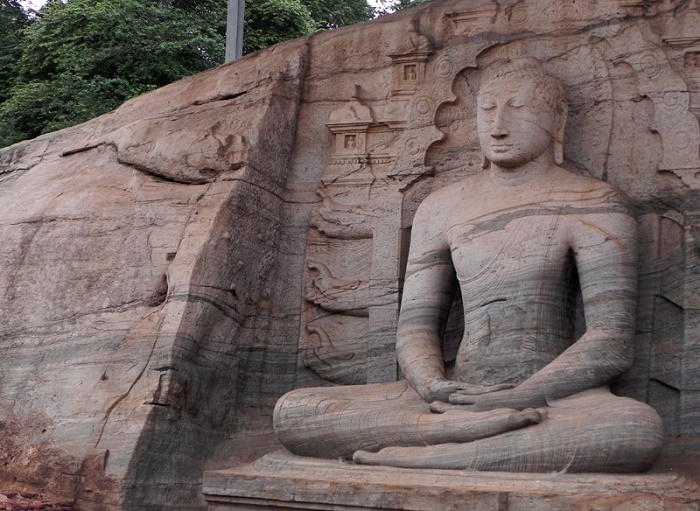 With a height of 7 meters (22 feet) and standing on a low pedestal shaped like a lotus, the statue leans back in a relaxed manner, where its arms are folded across the chest. 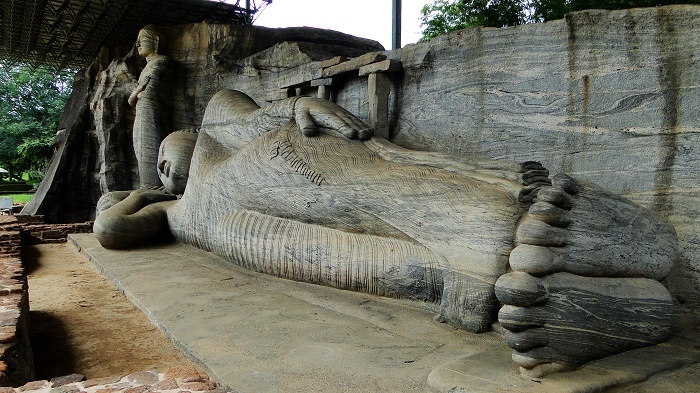 With the sorrowful expression that can be seen on the face of the statue, it is believed that this is actually the monk Ānanda, who is lamenting the Buddha’s demise at his deathbed. 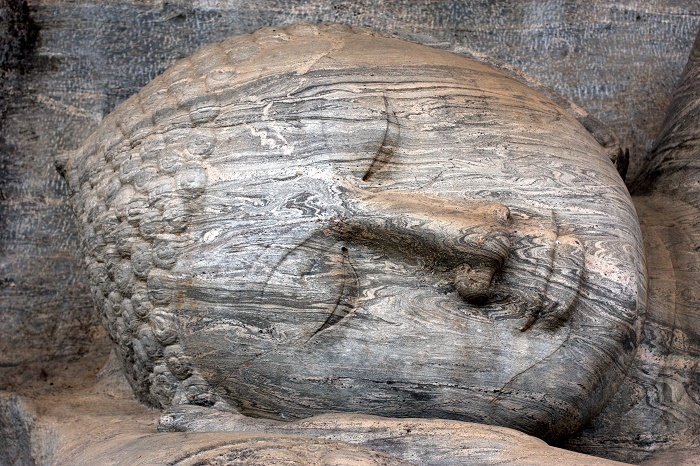 Nevertheless, there are others who believe that this image of Buddha shows his second week after enlightenment. 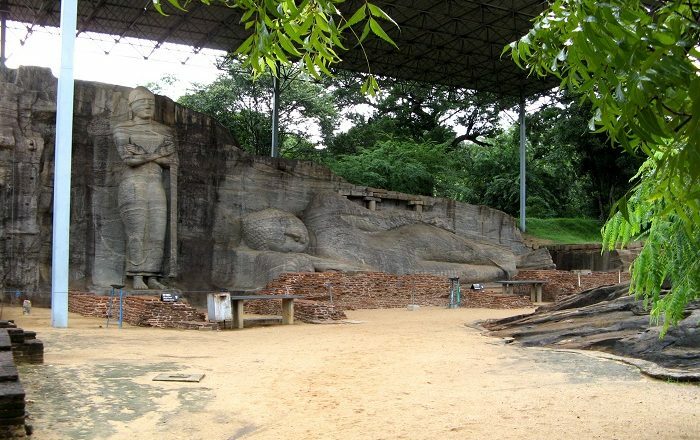 Lastly, the reclining image is definitely the biggest one with a length of 14 meters (46 feet) which makes it one of the largest sculptures in Southeast Asia. 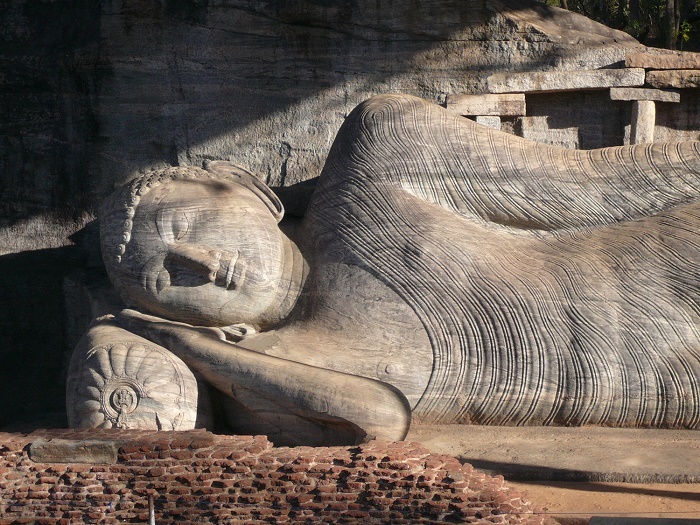 Depicting the parinirvana of the Buddha, who is lying on his right side with the right arm supporting the head on a bolster, while the left arm lies along the body and thigh, it is the most photographed among the statues. This image is different from the other ones also from the lack of decorated pedestal and it lies on leveled bare rock. In the back, on the wall, there are several sockets which have been carved into the rock, as well as the remains of two stone columns, suggesting that in the past, there might have been a wooden roof. 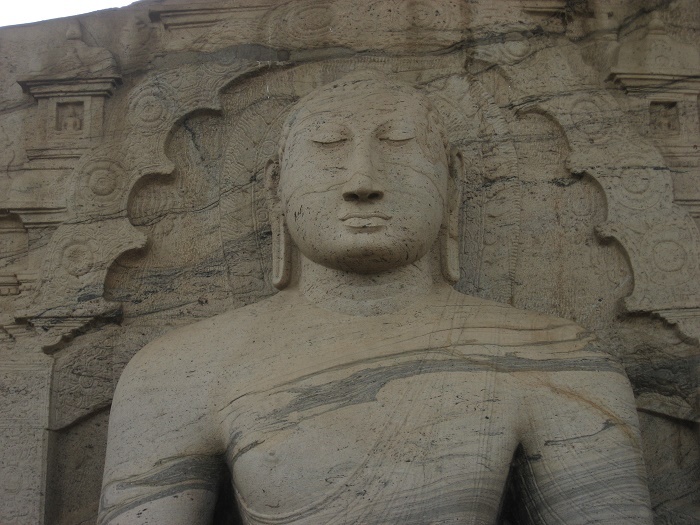 In conclusion, this magnificent group of statues have taken plenty of time to create them, but nowadays, we are certainly left mesmerized of the great effort that was used in their creation.